It's a writer's world! : Even a potentially bad movie can hold a compelling story at its heart. Even a potentially bad movie can hold a compelling story at its heart. So the saga of my thumbs has reached a hilarious peek. I'm chronicling that over at my humor blog, It can only happen to Sarah! But since I was really laid up last night after my cortisone shot, I had the time to watch a made for TV disaster pic called, "Impact." Okay, now that my shameless begging it out of the way, let's move on. Of course, there are also movies that are pretty bad, and were sort of meant to be bad, and yet, I love them, but not for obvious reasons. 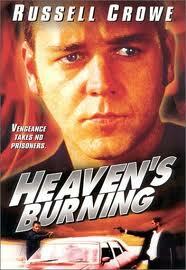 One of my favorite movies is "Heaven's Burning" a goofy, violent, buddy picture starring Russell Crowe. I admit it, I watched it at first because of Russell Crowe. It's early in his career, and filmed in Australia by Australian film makers. The plot is as convoluted as it is simple. I'm not going to give you all the details, just go rent it. It's one of those of inadvertently hilarious movies. But, and here's my point...at the end, you'll be cheering for the main characters and you'll weep at the very end. Rent it, I promise you won't regret it. Even bad movies can have a good story. Take the movie I watched last night. "IMPACT." It had all the elements of being a potentially bad flick. Overly dramatic, yet completely unclear title? Check. So for me, it was well worth the three house I sat in bed watching this movie. I found myself drawn in, in spite of the highly unlikely plot. (Which wound up being a tiny bit of a rip off of the movie "Armageddon.") And yes, I teared up at the very end. It's the same with books we read, isn't it? Maybe you don't like a certain genre of book, but you pick one up and you get sucked in because when you peal back all the bits you don't care for, at the heart, there's a compelling story. As writers, reading books that aren't necessarily in our genre is a good idea. You can pick up inspiration everywhere, and reading is so vital to writing. If you lived in a world where everything was exactly the one way you liked things, that would be boring. You have friends who are different from you, right? Step outside of your circle of what you love and take a look at something you think is going to stink. At the heart of it, you might find something very worthwhile. And that, my friends, will help you grow as a writer.